childbirth, as well as her partner and/or family by providing information, physical assistance and emotional support. with improved maternal and foetal health and a variety of other benefits. 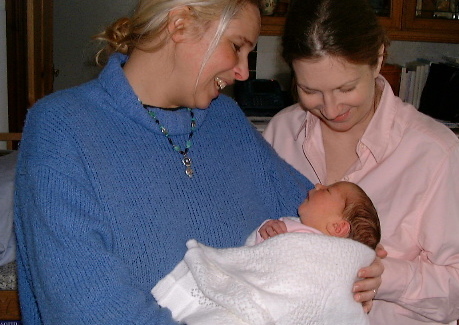 My husband and I had the great fortune to have a wonderful doula present at the births of both our precious daughters. I can often be heard to say that I 'couldn't have done either birth without her'... well not in the same way, that's for sure. I have asked Katinka to write an account of what happened when Natalia Hope entered our world, but in the meantime I wanted to share some of her love with you. It comes in the form of the words she wrote for Natalia on the occasion of her Christening/naming ceremony garden party. Katinka wrote these words in a beautiful book, and read them to our daughter in our garden, in front of close friends and family, on a beautiful sunny summer's day in 2007. Reading them back now, how apt they are. And how much we can all learn from them! Our blessings to you lovely one, how lucky we are to have you in our lives. We bring you tokens of the elements, as they combine in you in their unique way. May they bless, guide and protect you always. For Air - A feather and sparkly incense, the blessings of stillness and song, of the deep memories and the connection of your ancestors, and of inspiration, imagination and great ideas, and the breath of connection between all things and beings. For Fire - A candle, a sparkler, the blessings of fun, friendship, courage, dance, love and new beginnings. Of the fires of stars to light your nights and fires of Sun to warm your days. Fire of your brave heart to guide your way and fires of the deep earth to hold you safe. For Water - Two shells, one the spiral of life, one the challice of healing, the blessing of healing and compassion, of all emotions and the balance between them, of being one with the flow of life's energies, of intuition and dancing in the moonlight. For Earth - A crystal and a little dragon, for grounding and manifestation, for walking in balance on the Earth, for abundance, for family and friends and great food. For following your own unique path as you journey through your life. For connection to plants and animals and for the blessings of the hidden magical creatures that surround you. And finally this book, for you to draw, paint, write, dream and create in, representing the fifth element Spirit/Space, with all the blessings these will bring you. Wonderful light being Natalia, we all love you and give you a big hug, cuddles and kisses. Friends, food, art and dancing. Now that's what life is all about!